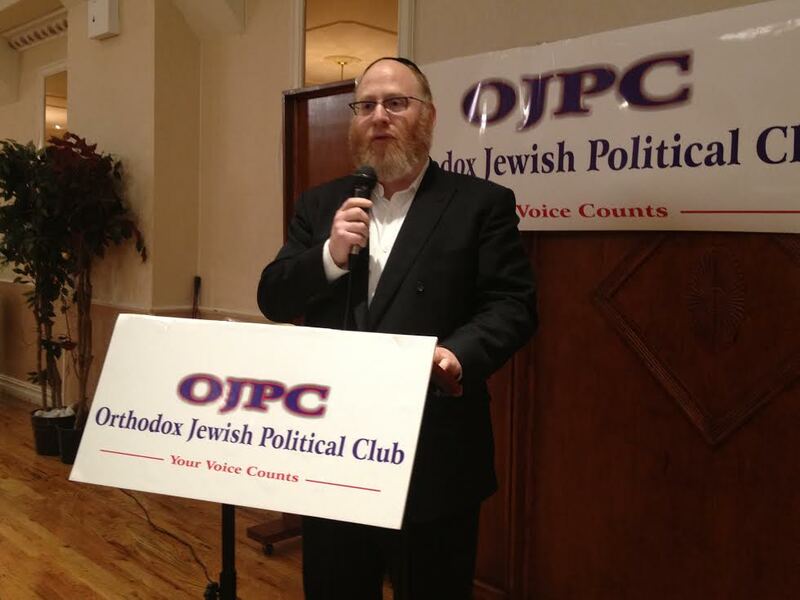 After a brief introduction by Mendy Reiner, chairman of the club, and an array of hot dishes, the crowd carefully listened to a rather compassionate plea delivered by the club’s treasurer Joe “Yossi” Gross, that focused on the issues that require special attention by the community’s elected officials. Mr. Gross highlighted the three top community needs on the agenda that relate to the individual in the community beside assisting local yeshivas and schools. First, Mr. Gross spoke about the need to advocate for the creation of business outreach centers that would assist hard working men and women who may not have the knowledge or experience of how to create a business and provide them with the tools they need to start an enterprise; whether it is teaching the individual how to write a business plan or matching the eager entrepreneur with a reasonable loan. Mr. Gross also urges activists to relay in meetings with elected official the need of creating a fair share of Affordable Housing for the Boro park community’s seniors and young married couples. Since it has become front and center of Mayor de Blasio’s administration’s summer agenda, Mr. gross emphasized that the housing inadequacy in the Borough Park community will get worse over the next decade because the number of New York citizens over 65 years of age will increase 40 percent over the 30 years between 1995 and 2025. As a result, a senior citizen housing crisis exists. The same applies to young married couples which is increasing now by over 1500+ a year. “Therefore, it is necessary for our community to foster housing opportunities for seniors and young married couples through zoning and planning actions and incentives to builders that are willing to work with us,” he said. The third issue Mr. Gross touched upon was the lack of business opportunities for community members. He noted that there are currently 17 banks on 13th avenue itself , yet most of their employees are brought in from outside the community. The banks should’ve been forced to have at least 50 percent employed from those that live in the community, he stressed. “For us to have people drive in from other neighborhoods, take up our parking space, which there is non available, and work in the banks while we have to go drive somewhere else to work is unacceptable,’ he added. Concluding his remarks, Mr. Gross also recommended to lobby for a tax credit for employers who employ workers receiving public assistance. “This will be an incentive for private employers to hire workers who were previously on public assistance,” he said. Communities volume of productive, competent individuals will increase. “If we advocate on these three top issues, lobby our lawmakers to take the lead and hold them accountable for their actions and inaction, Boro Park economic status will continue to improve,” Mr. Gross concluded. Councilman David Greenfield also attended part of the meeting, which included remarks by Reb Nachman Caller, a law attorney and the republican district leader, who briefed the club of his fight to stop the building of gambling casinos in the Catskills region. I would surmise that one needs a college degree to work at a bank. A teller probably needs a high school diploma as a minimum. Hence, the reason, you don’t see locals working in the banks. How many Yeshiva’s offer high school in borough park. if a bank has a high school diploma and a college grad competing for the same spot who do you think would be hired? yet most of their employees are brought in from outside the community. The banks should’ve been forced to have at least 50 percent employed from those that live in the community, he stressed.